With ever-increasing costs of conventional healthcare, and continuing issues with insurance coverage, alternative medicine is growing in popularity. Inasmuch as it is still officially denigrated, cannabis is about as "alternative" as it gets. This, despite no shortage of historic references to cannabis, or its extract marijuana (prepared from the dried and crushed flowers and leaves of the plant) as to its medicinal effects. Chinese Emperors Fu Hsi (2900 BC) and Shen Nung (2700 BC) are said to have touted its healing effects. Some authorities claim that the anointing oil in Exodus 30:22-25 contained cannabis, and that "cane" is a mistranslation from the original Hebrew (1450 BC). Getting more into modern times, marijuana was added to the US Pharmacopeia in 1850, and its use is indicated for an astonishingly diverse litany of illnesses. According to this PDQ Review from the National Cancer Institute, and referring to this illustration, cannabis may lessen the progression of cancer cells. It also alleviates pain, lowers inflammation and decreases anxiety. An oft-cited study from 1996 on mice and rats suggested that cannabinoids (any of various chemical constituents of cannabis) may have a protective effect against the development of hepatic adenoma tumors and hepatocellular carcinoma. The study also noted decreased incidences of benign tumors in other organs (mammary gland, uterus, pituitary, testis, and pancreas). Cannabinoids have the advantage of being well tolerated in animal studies and they do not present the generalized toxic effects of most conventional chemotherapeutic agents. Cannabinoids selectively affect tumor cells more than their nontransformed counterparts that might even be protected from cell death. Even if further in vivo research is required to clarify [their] action in cancer and especially to test their effectiveness in patients, the cannabinoid system represents a promising target for cancer treatment. Several controlled clinical trials have been performed, and meta-analyses of these support a beneficial effect of cannabinoids (dronabinol and nabilone) on chemotherapy-induced nausea and vomiting (N/V) compared with placebo. Both dronabinol and nabilone are approved by the U.S. Food and Drug Administration for the prevention or treatment of chemotherapy-induced N/V in cancer patients. Thus, the FDA has approved two drugs, which are nothing more than synthetic versions of chemicals in cannabis. In addition to the anti-nausea/vomiting properties, dronabinol is used to treat loss of appetite in people with AIDS. Analgesic properties are also claimed for both drugs. 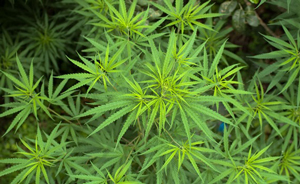 However, owing to the bizarre stigmatization of cannabis, and the difficulty in obtaining proper clearance to study it in clinical settings, there is only a limited amount of published research available on the palliative properties of the source plant itself. Yet, anecdotal evidence of its effects is widely disseminated. The website Surviving Mesothelioma offers inspiring stories of several people who have survived this rare form of cancer. The disease develops from cells of the mesothelium, a membrane that protects the body's major internal organs and allows them freedom of movement (for example, lung contractions). The five-year survival rate is poor—at nine percent or less—and has not improved much over the last 30 years. The chronicle of Andy Ashcraft is quite compelling. He was diagnosed with late stage pleural mesothelioma in 2010, and given three months to a year. Far from being resigned to this fate, Andy and his wife investigated and embarked on alternative therapies, including cannabis oil. Six years later, alive and well, he really has beaten the odds, and is another one of those "anecdotal" cases of an alternative approach success.